Equalizer with three bands: BASS, MID BASS, MID HIGH beyond traditional resources Level, High Pass and Low Pass. RMS Power in 1 Ohms 12,6V 3000W RMS. RMS Power in 2 Ohms 12,6V 2100W RMS. RMS Power in 1 Ohms 14.4V 3600W RMS. Stetsom EX5000 EQ – 1 OHM - Mono High Power Car Audio Amplifier 5,600 w RMS at 14.4 VDC- Authorized Stetsom Dealer. 1 x Stetsom Amp EX5000EQ at 1ohm. RMS Power at 1 Ohm 12.6V 5000W RMS. RMS Power at 2 Ohm 12.6V 2800W RMS. Used in good working condition. Item location: Glassboro New Jersey. Stetsom EX8000 EQ – 1 OHM - Mono High Power Car Audio Amplifier 8,900 w RMS at 14.4 VDC - Authorized Stetsom Dealer. 1 x Stetsom Amp EX8000EQ at 1 ohm. RMS Power at 1 Ohm 12.6V 8000W RMS. RMS Power at 2 Ohm 12.6V 5100W RMS. Stetsom EX8000 EQ – 2 OHMs - Mono High Power Car Audio Amplifier 8,900 w RMS at 14.4 VDC - Authorized Stetsom Dealer. EX8000 EQ features 1 x Stetsom Amp EX8000EQ at 2 ohms. - Equalizer with three bands: BASS, MID BASS, MID HIGH beyond traditional resources Level, High Pass and Low Pass. Stetsom EX5000 EQ – 2 OHMS - Mono High Power Car Audio Amplifier 5,500 w RMS at 14.4 VDC- Authorized Stetsom Dealer. 1 x Stetsom Amp EX5000EQ at 2 ohms. RMS Power at 2 Ohm 12.6V 5000W RMS. RMS Power at 4 Ohm 12.6V 3050W RMS. Bass EQ: -10 dB to 10 dB. RMS Power in 1 Ohms 12,6 V 3000 W RMS. RMS Power in 2 Ohms 12,6 V 2100 W RMS. RMS Power in 1 Ohms 14.4 V 3600 W RMS. RMS Power in 2 Ohms 14.4 V 2400 W RMS. EQ Mid-Bass: -10 dB to 10 dB. 1 x Stetsom Amp EX5000EQ at 1ohm. Amplifier EX5000 EQ - 5600 Watts RMS 1 ohm Digital Amp Built-In EQ - 5k. RMS Power at 1 Ohm 12.6V 5000W RMS. RMS Power at 2 Ohm 12.6V 2800W RMS. RMS Power at 1 Ohm 14.4V 5600W RMS. 1 x Stetsom Amp EX8000EQ at 2 ohms. 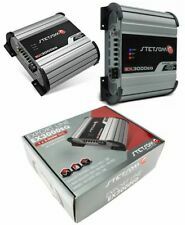 RMS Power at 2 Ohm 12.6 V 8000 W RMS. RMS Power at 4 Ohm 12.6 V 5000 W RMS. RMS Power at 2 Ohm 14.4 V 8950 W RMS. RMS Power at 4 Ohm 14.4 V 6050 W RMS. DS18 Marine Audio Logic PRV Timpano Massive Audio. Trending at $527.48eBay determines this price through a machine learned model of the product's sale prices within the last 90 days. 1 x Stetsom Amp EX5000EQ at 2ohm. RMS Power at 2 Ohm 12.6V 5000W RMS. RMS Power at 4 Ohm 12.6V 2800W RMS. RMS Power at 2 Ohm 14.4V 5600W RMS. RMS Power at 4 Ohm 14.4V 3400W RMS. Impedance Output 1 OHM. 1 x Stetsom EX10500 EQ – 2 OHM - Mono High Power Car Audio Amplifier. RMS Power at 2 Ohm 12.6V 10500W RMS. RMS Power at 4 Ohm 12.6V 6400W RMS. RMS Power at 2 Ohm 12.6V 3900W RMS. RMS Power at 2 Ohm 14.4V 11600W RMS. 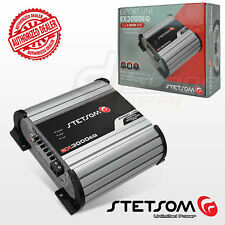 Stetsom EX3000 EQ – 2 OHMS - Mono High Power Car Audio Amplifier 8,900 w RMS at 14.4 VDC- Authorized Stetsom Dealer. EX3000 EQ features EX3000 EQ – 2 Ohms Features - Equalizer with three bands: BASS, MID BASS, MID HIGH beyond traditional resources Level, High Pass and Low Pass. Stetsom HL800.4 – 2 OHMS - Car Audio High Line Amplifier 4 Channels- Authorized Stetsom Dealer. 1 x Stetsom HL800.4 – 2 OHMS - Car Audio High Line Amplifier 4 Channels. Impedance Output STEREO 2 OHMS / STEREO 4 OHMS. 1 x Stetsom Amp EX5000EQ at 1ohm. Stetsom EX5000 EQ – 1 OHM - Mono High Power Car Audio Amplifier 5,600 w RMS at 14.4 VDC - Authorized Stetsom Dealer. RMS Power at 1 Ohm 14.4V 5600W RMS. RMS Power at 1 Ohm 12.6V 5000W RMS. 1 x Stetsom EX10500 EQ – 1 OHM - Mono High Power Car Audio Amplifier. RMS Power at 1 Ohm 12.6 V 10500 W RMS. RMS Power at 2 Ohm 12.6 V 6400 W RMS. RMS Power at 4 Ohm 12.6 V 3900 W RMS. RMS Power at 1 Ohm 14.4 V 11600 W RMS. The Stetsom EX 3000 Amplifier is Stetsom's newest model. It has Digital technology, providing low battery consumption in its automotive sound system, in addition to having its size and reduced weight. Stetsom Ex3000 Eq 3000w Rms 2 Ohms Amplifier Module. Stetsom Export Line Amplifier Module EX 3000 EQ 3000W RMS 1 Channel 2 Ohms RCA Mono. • RMS Power in 2 Ohms 12,6V: 3000W RMS. • RMS Power in 4 Ohms 12,6V: 2100W RMS. 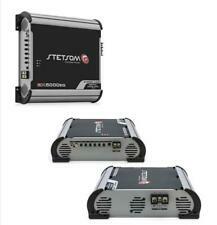 Stetsom EX13500 EQ – 1 OHM - Mono High Power Car Audio Amplifier 14,200 w RMS at 14.4 VDC - Authorized Stetsom Dealer. 1 x Stetsom Amp EX13500EQ - 1 OHM. - Equalizer with three bands: BASS, MID BASS, MID HIGH beyond traditional resources Level, High Pass and Low Pass. Stetsom EX10500 EQ – 1 OHM - Mono High Power Car Audio Amplifier 11,600 w RMS at 14.4 VDC - Authorized Stetsom Dealer. 1 x Stetsom EX10500 EQ – 1 OHM - Mono High Power Car Audio Amplifier. RMS Power at 1 Ohm 12.6V 10500W RMS. Stetsom EX10500 EQ 2 Ohms Mono Amp High Power. Car Audio Amplifier 11600W RMS. RMS Power in 2 Ohms 14.4V 11600W RMS. EXPORT LINE STETSOM EXPORT LINE STETSOM. Performance to enchant! RMS Power in 2 Ohms 12,6V 10500W RMS. Stetsom Ex8000 Eq 8000w Rms 1 Ohm Amplifier Module. 1 Stetsom Ex8000 Eq Amplifier - 1 Ohm. Export Line Stetsom: A Line Of Export Type Products That Will Delight The World And Brazil. Export Line Stetsom. Stetsom EX10500 EQ 1 Ohm Mono Amp High Power. Car Audio Amplifier 11600W RMS. RMS Power at 1 Ohm 14.4V 11600W RMS. EXPORT LINE STETSOM EXPORT LINE STETSOM. Performance to enchant! RMS Power at 1 Ohm 12.6V 10500W RMS. Stetsom Export Line EX 5000 Digital Amplifier Module 5000W RMS 1 Channel 1 Ohm RCA. Designed for you to enjoy your favorite tunes with a lot more quality, this Stetsom Amplifier Module is a must-have presence in those projects that are passionate about automotive sound. Stetsom Ex8000 Eq 8000w Rms 2 Ohms Amplifier Module. 1 Stetsom Ex8000 Eq Amplifier - 2 Ohms. Export Line Stetsom: A Line Of Export Type Products That Will Delight The World And Brazil. Export Line Stetsom. Stetsom EX21000 EQ 1 Ohm Mono Amp High Power. Car Audio Amplifier 21000W RMS. New EX21000 EQ – 1 Ohm from EXPORT LINE, the line of automotive amplifiers developed to delight Brazil and the World. The New EX21000 EQ is an Amplifier for fans of #SomAutomotive or for competition lovers! Trending at $1,216.00eBay determines this price through a machine learned model of the product's sale prices within the last 90 days. Stetsom Export Line EX 5000 Digital Amplifier Module 5000W RMS 1 Channel 2 Ohms RCA. Designed for you to enjoy your favorite tunes with a lot more quality, this Stetsom Amplifier Module is a must-have presence in those projects that are passionate about automotive sound. 1 x Stetsom Amp EX8000EQ at 2 ohms. RMS Power at 2 Ohm 12.6 V 8000 W RMS. RMS Power at 4 Ohm 12.6 V 5000 W RMS. RMS Power at 2 Ohm 14.4 V 8950 W RMS. RMS Power at 4 Ohm 14.4 V 6050 W RMS. Input Sensitivity 0,2 V.
Equalizer with three bands: BASS, MID BASS, MID HIGH beyond traditional resources Level, High Pass and Low Pass. RMS Power in 2 Ohms 12,6V 3000W RMS. RMS Power in 4 Ohms 12,6V 2100W RMS. RMS Power in 2 Ohms 14.4V 3600W RMS. Equalizer with three bands: BASS, MID BASS, MID HIGH beyond traditional resources Level, High Pass and Low Pass. Bass EQ: -10dB to 10dB. EX 3000 EQ features Number of Channels 1. RMS Power in 2 Ohms 12,6V 3000W RMS. Equalizer with three bands: BASS, MID BASS, MID HIGH beyond traditional resources Level, High Pass and Low Pass. Bass EQ: -10dB to 10dB. EX 3000 EQ features Number of Channels 1. RMS Power in 1 Ohms 12,6V 3000W RMS. Stetsom EX3000 EQ – 1 OHM - Mono High Power Car Audio Amplifier 3,550 w RMS at 14.4 VDC- Authorized Stetsom Dealer. EX3000 EQ features EX3000 EQ – 1 Ohm Features - Equalizer with three bands: BASS, MID BASS, MID HIGH beyond traditional resources Level, High Pass and Low Pass. Stetsom EX3000 EQ – 1 OHM FREE Reducer - Mono High Power Car Audio Amplifier 3,550 w RMS at 14.4 VDC- Authorized Stetsom Dealer. EX3000 EQ – 1 Ohm Features 1 x EX3000EQ-1 with FREE Screw-In Reducer. 1 x Stetsom Amp EX5000EQ at 1ohm. RMS Power at 1 Ohm 12.6V 5000W RMS. RMS Power at 2 Ohm 12.6V 2800W RMS. RMS Power at 1 Ohm 14.4V 5600W RMS. RMS Power at 2 Ohm 14.4V 3400W RMS. Impedance Output 1 OHM. 1 x Stetsom Amp EX8000EQ at 1 ohm. RMS Power at 1 Ohm 12.6V 8000W RMS. RMS Power at 2 Ohm 12.6V 5100W RMS. RMS Power at 4 Ohm 12.6V 3030W RMS. RMS Power at 1 Ohm 14.4V 8900W RMS. RMS Power at 2 Ohm 14.4V 6000W RMS. Stetsom EX3000 EQ – 1 OHM - Mono High Power Car Audio Amplifier 3,550 w RMS at 14.4 VDC- Authorized Stetsom Dealer. 2 x Stetsom EX3000EQ at 1 Ohm. RMS Power at 1 Ohm 12.6V 3000W RMS. RMS Power at 2 Ohm 12.6V 2100W RMS. Stetsom EX13500 EQ 1 Ohm Mono Amp High Power. Car Audio Amplifier 13500W RMS. RMS Power in 1 Ohm 12,6V 13500W RMS. The Stetsom EX 13500 is the newest Stetsom model. It has Digital technology, providing low battery consumption in your automotive sound system. The Stetsom Force One Amplifier Module is Stetsom's newest release! With power of 112000w rms! Stetsom Force One 112.000 Watts RMS. The Stetsom Force One also has several technologies to facilitate its use and increase the safety of automotive sound.